Oh. My. Gosh. This is too good. I got this from Hungry Girl (bless her! ), and I’m wowed. I’ve never been anti-veggie burger like a lot of meat eaters are, because I appreciate it for what it is – not meat. If you don’t think about it not being meat, you won’t hate it. I got the flame-grilled Boca burgers to get the taste. My husband also liked it – so it got man-points. Preheat oven to 400 degrees. Spray a baking sheet with non stick spray. Lay tortillas flat on the sheet, and spray with non stick spray. Bring a skillet sprayed with non stick spray to medium heat. Cook burger patty for about 4 minutes per side, until cooked through. Set burger aside to cool. Remove skillet from heat, re-spray, and bring to medium heat. Add onion and cook and stir until softened, about 4 minutes. Transfer onion to a medium microwave-safe bowl. Chop burger patty and tear cheese slices into pieces. Add both to the bowl. Microwave for 30 seconds or until cheese has melted. Mix thoroughly. Top with remaining ingredients and devour! I think you can probably skip cooking the veggie burger on the skillet and just go straight to the microwave. There’s directions on the box for cooking them in the microwave. That’s one less thing to wash. Since they’re so low in points, I made a double batch and we each ate two, which was just right. It felt like a lot of food for the points! If you try it – let me know what you think! 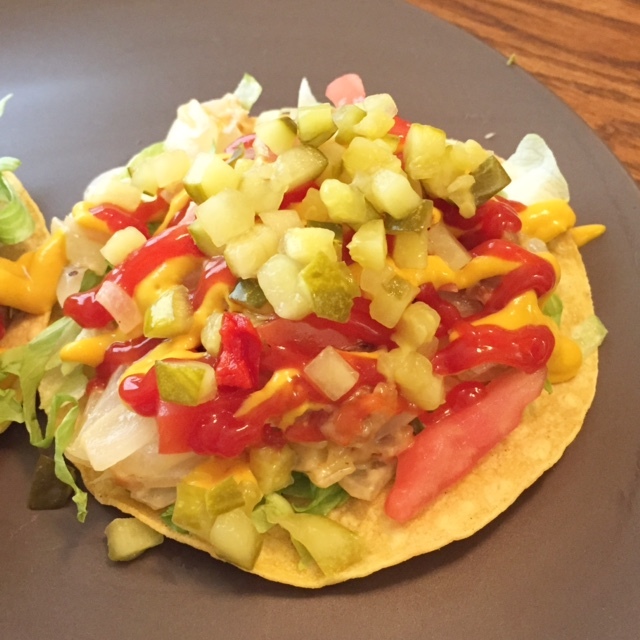 What variations would you put on your tostada? Considering that I was playing around, this is great! It has an after-kick that hits you once the peanut flavor goes away. Very easy to make! After cubing your chicken, cook it thoroughly in a skillet or wok that has been prepped with cooking spray. Add your diced onion, red bell pepper, and scallions. Begin to stir fry. Add freshly grated ginger, a few shakes of soy sauce, red pepper flakes, and red chili paste. Continue to stir fry. Add peanut butter. Begin stirring to evenly distribute it throughout the stir fry. Put 2/3 cup brown rice in a bowl (additional 4pp), and top with 1/6 of the chicken mixture. This is a delicious sandwich! For only 6pp, you can’t beat it! This is an official Weight Watchers recipe. If you have some tomato soup handy, this is a GREAT rainy day soup/sandwich combo. My husband absolutely loved it. Mix the first three ingredients together. Spread evenly across all four slices of bread. Mix the two cheeses together, and sprinkle a fourth of the mixture on two of the slices. Put half of your ham on each of those two slices, and then top with the remaining half of the cheese mixture. Top with the remaining two slices of bread, sauce side down. Spray cooking spray on a skillet or griddle, and cook like you would a normal grilled cheese. Sheesh – I’m ready for the week to be over already. Four more hours! We’re going grocery shopping tonight, and I’m excited. Not for any particular reason really, except for that I’m cooking a lot more now. That’s been a huge positive factor for me with Weight Watchers. I’m cooking a lot more, and in much more variety. Like I’ve mentioned before, I’m been really scared of cooking recipes and not knowing what the caloric intake was, so I just stuck to prepackaged foods a lot. And there’s only so much of that you can enjoy. But, for example, this week I’m going to be making an awesome looking Thai peanut noodle recipe, a great shrimp recipe, some rosemary/swiss grilled cheese sandwiches I’m really excited about, and a really good strawberry oatmeal parfait. That’s SO MUCH better than canned soup. Over. And Over. And Over. Plus I get to envision myself as Giada De Laurentiis and be her for a half hour. Also… I’ll have some good results on Weigh-in Monday, I’m pretty sure. 😉 Woohoo! Can I just say how impressed I am with Harris Teeter? I went to another local grocery store for the longest, until I got home and would keep discovering expired food. So I switched stores and haven’t looked back. 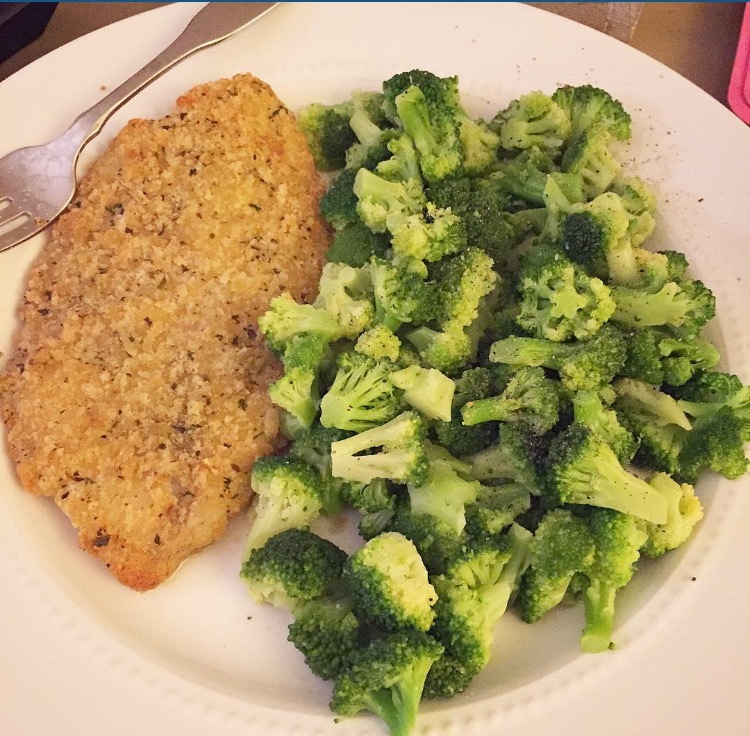 Last night’s meal was Daily Chef Parmesan Crusted Tilapia (5pp from Sam’s Club) and steamed broccoli. I’ve been accidentally stocking up too much on steamed veggies, so my freezer is full and I need to eat it at every meal basically to empty out my freezer. I enjoy broccoli a lot, and was SO HAPPY when I poured out my florets on to my plate and saw just that. Florets. Nothing but florets. None of that half-florets-half-stems-ok-mostly-stems crap. I’m sold. Plus the store brand is cheaper anyway. SO GO OUT AND BUY HARRIS TEETER STEAMABLE BROCCOLI FLORETS!